← The Southern Secret to Surviving Summer. If you’re anything like me, the notion of Casual Friday didn’t go down easily. But, working in a “creative” environment — the advertising and marketing world — where clothing is almost optional, I’ve gotten used to the idea. In my own way. Casual to me still means tailored. Clothing, no matter how formal or informal should fit. And it should be something comfortable. The picture above is an example of my typical “Friday-wear.” Suitable for work (in a casual setting) and happy hour at the bar. Although I’d change if going out to dinner. So, let’s get down to brass tacks. Starting at the top, which in this case is the bottom half of my ensemble: the pants. I hesitate to call them trousers since they are stone-colored linen and cotton jeans from J. Crew. Yup, five pockets, brass rivets at the seams and all. They end a 1/4″ above my shoes. Supporting the jeans at my waist is a tan suede belt. And as long as we’ve mentioned the shoes…. tan suede driving shoes. These happen to be Tod’s, but less expensive versions are available through Land’s End and J. Crew. Suede shoes always up your style quotient. If you don’t have a pair of loafers and a pair of lace-ups in brown suede, please save up and invest ASAP. They go with everything. Darker browns will wear beautifully with blue flannel, grey flannel, khaki and jeans. (The link is to a pair at J. Crew again, they are a bit clunky, but a decent start. The better brands will all carry suedes and are well worth the extra money. I think that Churches’ made a fortune twice over with their suede monkstrap.) Elegant shoes mark you as an elegant dresser. The shirt is a silk, ribbed polo in sky blue which I found at Marshall’s or TJ Maxx a long time ago. You could just as easily substitute a slim cut polo (maybe even in mercerized cotton to give you that polished look) from any of the usual suspects. I say tailored because they fit me better. Especially under a jacket. You know you; do what works best for your body type. There is always your alterations tailor, remember! 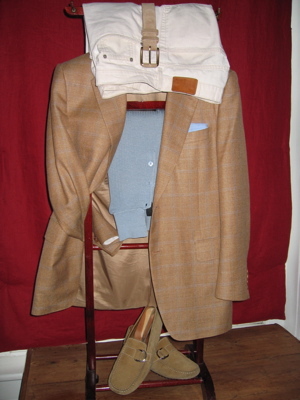 The sportcoat (this is Canali, because it is an off-the-rack brand that fits me well with minimal tailoring) is a wheat color with a very faint sky blue overcheck, which is brought out by the shirt and the blue and white cotton mini-check pocket square. Yes, I’m breaking some rules here in late Summer. The pants are a bit light and the shoes correspondingly so. But it’s still hovering around the 80ºF mark with humidity to boot. This week the temperatures will be about ten degrees above normal pushing up to 88ºF if the advanced forecast is to be believed. If you’re loathe to wear the lighter colors, blue jeans, a white (or sky-blue, white, khaki striped) shirt and darker brown suede shoes would look just as good. Give some thought to your “casual” wardrobe and strike a blow for a more elegant Friday. This entry was posted in Living and tagged casual clothing, clothing, Living. Bookmark the permalink.